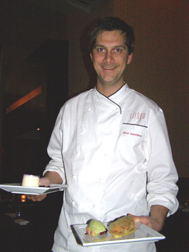 Executive Chef Jimmy Lappalainen of Riingo at The Alex Hotel grew up in Sweden and creates inspired American and Japanese cuisine in New York City which is fitting, as this talented chef has clearly mastered combining elements in a contemporary ambience. I met with Chef Jimmy Lappalainen one beautiful afternoon before having dinner to learn more about this fascinating chef. First of all, there is his background: born to Finnish parents who moved to Sweden, he grew up in a small community one hour north of Gothenburg, which is the heart of Swedish gastronomy. His grandfather hunted, his parents took him mushroom picking, his mother was always cooking; in short, he was surrounded with fresh ingredients and good food from a young age that helped influence his career path. After graduating with a culinary degree from the Ester Mosessons School in Gothenburg where Swedish Chef Marcus Samuelsson had also graduated, he worked at a wonderful restaurant in Gothenburg where the owner taught him the importance of treating your staff with respect, which he applies today working with his own staff. From there, he worked throughout Europe honing his craft, and when Marcus Samuelsson approached him to work at his Scandinavian restaurant, Aquavit in New York, it was a challenge he readily accepted, and learned much during his tenure there as a line cook. He joined Riingo as the Executive Chef in 2006, which is also a Marcus Samuelsson restaurant. So, my burning question to him was of course, how did he make the transition to cooking American and Japanese cuisine? He replied that being a chef should always be a challenge, however, before coming to New York he always liked Chinese/Thai/Asian food, and that sparked his interest to read and to learn more about the techniques, spices, and sauces. American food in New York can be very different from other parts of the United States and does not have to be steak, potatoes, and gravy, what is usually associated with American cuisine. In New York, American cuisine can be diverse and there are so many ingredients available here that you can combine different parts of America. 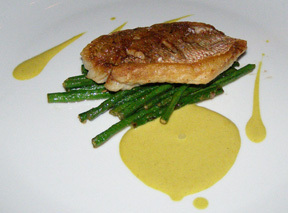 His focus is that it is all about the food; that it is approachable, relaxed, but also fresh and flavorful. 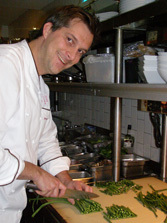 When not creating new recipes for the restaurant, he enjoys spending time with his wife and their two young children. The menu changes seasonally, the prix fixe lunch menu changes weekly, there are holiday tasting menus, and yet happily, their signature dessert of Green Tea Donuts with Green Tea Filling, Green Tea Ice Cream, Cinnamon Sabayon, and Fruit Chutney remains a constant. Chef Jimmy graciously shares his recipes for an exciting three-course menu, including the recipe for Riingo's signature Green Tea Donuts. Filling Method: Once you have all the ingredients chopped and sliced, heat a large skillet over medium hear and add 2 tablespoons of peanut oil. When it is hot, add the shallots, ginger, garlic, and sauté until tender. Add the cabbage and cook until it is soft, about 3-4 minutes. Add duck meat, scallions, soy sauce, and egg to the skillet and cook until the egg is set, and then season the mixture with salt and white pepper. Remove the mixture from the skillet to a bowl. Let mixture cool before you make the dumplings. Lay the dumpling wrappers on your work surface and put a half spoonful of dumpling mixture on each of the wrappers. Moisten the wrappers with a little bit of water and fold it over to form a half moon shape. Make 5-6 small folds along the edge of the filled dumpling to make sure that the dumpling stays closed. Continue until all of the dumpling wrappers are filled. Once you have the dumplings made, heat a skillet to medium heat, add the remaining peanut oil, and add the dumplings to the skillet fold side up and cook 3-4 minutes or until the bottoms are crispy and golden brown. Add ¼ cup of water to the pan and cover with a lid and cook until the water has evaporated. Remove the lid and cook for 1 minute. 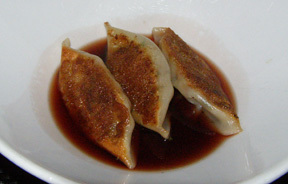 Place the dumplings in soup bowls and pour the hot fig broth over them. Method: Bring everything to a boil, strain through a sieve and set aside while making the rest of the broth. Heat a pot over medium heat, add oil and then add the onion, ginger, lemon grass, garlic and figs. Sauté until the onions begin to caramelize, and then add the sake or white wine, dashi, and chicken stock. Adjust the heat to medium low and let the broth simmer for about 30-40 minutes. Add salt and white pepper to taste and strain through a sieve. Pour some of the spicy sour liquid that you first created into the broth until you reach your desired balance of spicy and sour. Method: Cut the Chinese Long Beans to 1½ - 2-inches (3.8 - 5 cm) in length and blanch in salted water. Drain, and sauté them with the chopped shallots, garlic, and ginger in a pan over high heat with 2 tablespoons canola oil. Season to taste with salt and white pepper. Heat a skillet over medium high heat and add the remaining canola oil. Season the filets with salt and white pepper. Add them to the skillet skin side down. Lower the heat to medium and add the butter, and continue to cook the fish until the skin is golden brown and crispy. Method: Chop the onion and the garlic, and sauté them over medium heat. Add the curry and stir to combine. Deglaze with the sake and then add the coconut milk and dashi. Bring the mixture to a boil and then reduce the heat to low and slowly simmer to reduce the sauce until it is reduced to 1/3. Pour the sauce into a blender and process until smooth, then pass through a chinoise. Season to taste with salt, white pepper, and yuzu juice. Presentation: Place the Chinese long beans in the middle of the plate and put the red snapper skin side up on top of the long beans. Pour some of the sauce nicely around the fish and the beans. 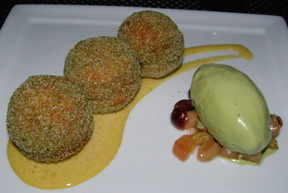 The Green Tea Donuts with Green Tea Filling, Green Tea Ice Cream, Cinnamon Sabayon, and Fruit Chutney are Riingo's signature dessert. Crispy and delectable, they keep patrons coming back to the restaurant for another luscious taste. Method: Dissolve the yeast in the warm water and set aside. Heat the butter, milk, sugar, and vanilla bean. Bring to room temperature and then add the rum. Mix the potato and the flour together, and then add the milk and rum mixture. Add the eggs and the yeast, mix, and let proof in a warm place, covered, until double in size. When the dough has doubled in size, cut the dough with a round mold, 1-inch (2.5-cm) in diameter. Deep fry the balls until golden brown, drain on paper towels, and fill with the green tea filling and roll in sugar. Method: Combine all ingredients together in a mixer. Method: Bring milk and half the amount of sugar to scalding. Whisk the egg yolks and the remaining sugar together in a bowl. Temper together and let sit for 10 minutes. Strain, let cool in an ice bath, and then process in an ice cream machine. Method: In a bowl, mix all of the ingredients, and whisk until thick and creamy over a double boiler. Remove from heat and let cool to room temperature by whisking it in an electric mixer. Method: In a heavy bottom pan, heat oil, add all of the spices, and sauté for 1 minute. Add the fresh fruit and sauté for about 5 minutes, then add the sugar and the dried fruit and cook for an additional 5 minutes. Finish by adding the yuzu juice and salt. Let cool and serve at room temperature. Read other articles on The Alex Hotel and Riingo in the Hotels and Resorts and Restaurants sections. Read other articles on New York in the Destinations, Hotels and Resorts, Restaurants, Chefs' Recipes, Spas, and Luxury Products sections. For information and upcoming events taking place in New York, please visit the website: www.NYCVisit.com. © December 2008. Luxury Experience. www.LuxuryExperience.com All rights reserved.